It’s common to have a dedicated study in a new property, and if you often work from home, you need to make it the best it can be. Follow these tips for optimising your home workspace and you’ll be more productive than ever. It doesn’t matter how much time you spend in this space, it is absolutely imperative that you protect your neck and spine by investing in a good desk and chair. Make sure your desk is at the right height for you, so your arms rest easily at right angles. To go with your desk, you'll need a well-designed ergonomic chair. Check out the great range at Corporate Chairs. 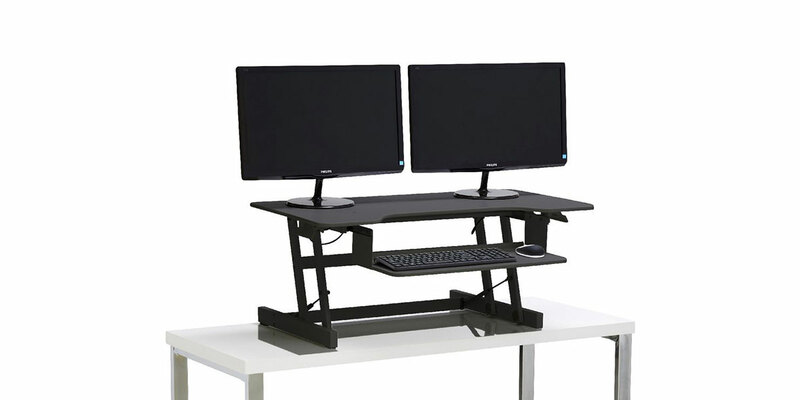 Alternately, you can buy a desk similar to this one from Officeworks so you can alternate between sitting and standing. Buy a wireless printer and run all other cords behind furniture and along the wall, so when you raise your desk to a standing position, you won’t get tangled up in cords. When you work from home, it’s easier to get distracted by your personal life. If your study doesn’t have a door, use a standing divider so you can close it off at night. And use different artwork in your home office than you would use in other rooms. This way, when you step into the study you’ll feel like you’ve made a transition to work. It’ll be easier to get things done if you have everything stored in its rightful place. Add bread clips to your power cords so you know which one is which, clean up your drawer organisers and create ‘zones’. Separate the work zone (desk and the computer) from the reference zone (how-to manuals, reference books, binders, filing cabinets, etc) and the supply zone where the office supplies are kept. If your home office is on the small side, however, go vertical. Think about floating shelves, hanging filing systems or a panel of wall-mounted caddies. Wall organisers are practical and convenient because your files are easily accessible and visible. The right kind of lighting doesn’t just affect your eyes, it can also affect your mood. Make sure you’re looking after both. Natural light is best, but if you don’t have enough access to it, or you’re a night owl, then invest in a good lamp. Use light bulbs with colour temperatures of 5000K or higher — often called ‘daylight’ bulbs, as they provide just about the same level of brightness as natural daylight. You absolutely must have an indoor plant in your home office. Not only will it purify the air, but it’ll also improve your mood. Pretty indoor plants like Maidenhair ferns and Fiddle Leaf Figs will brighten up the space. Read this article to find out how to care for your indoor plants.